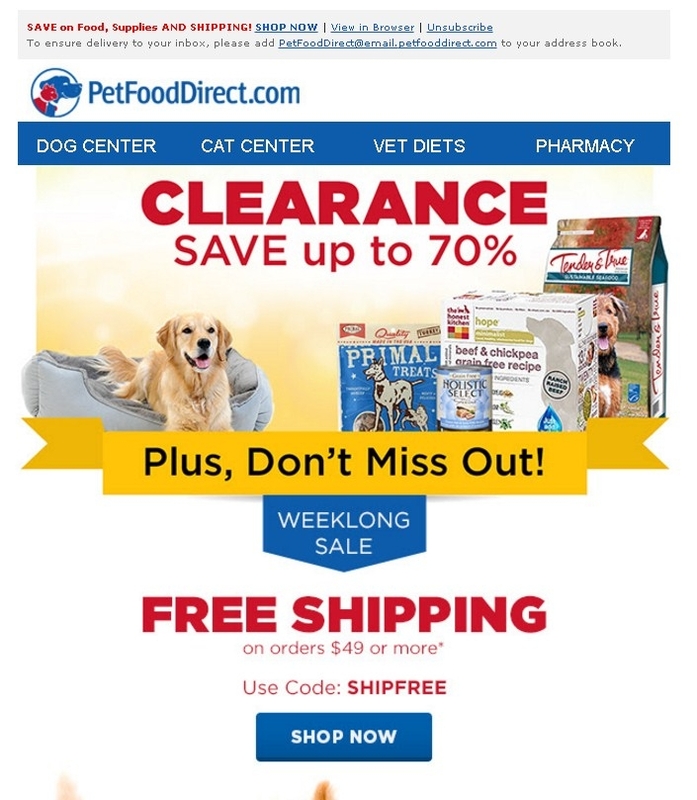 Hector Romero Free Shipping on Orders Over $49 at PetFoodDirect. Put code SHIPFREE in your shopping cart. This offer is for time limited. 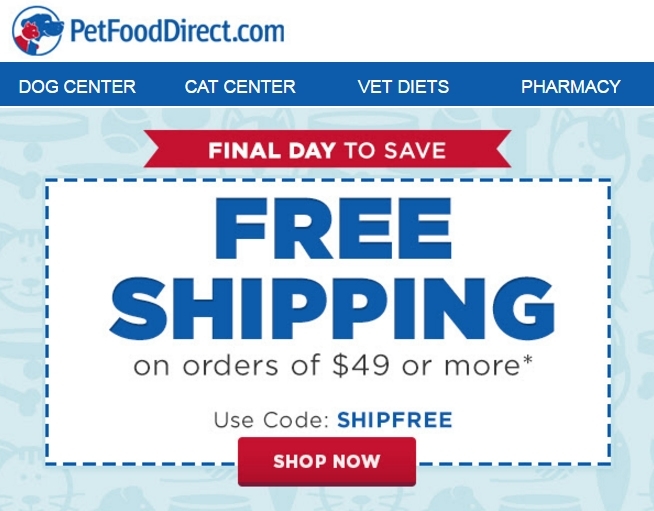 Luis Romero Free Shipping on Orders Over $49 at PetFoodDirect. Put code SHIPFREE in your shopping cart. This offer is for time limited. Marc Evans Offer ends at 11:59 pm ET, July 23, 2017. Free Shipping valid on orders of $49 or more. Enter promo code SHIPFREE at checkout to redeem. Tested this promo code and verified that it works as described. Angel I am validating that this coupon works correctly as described. 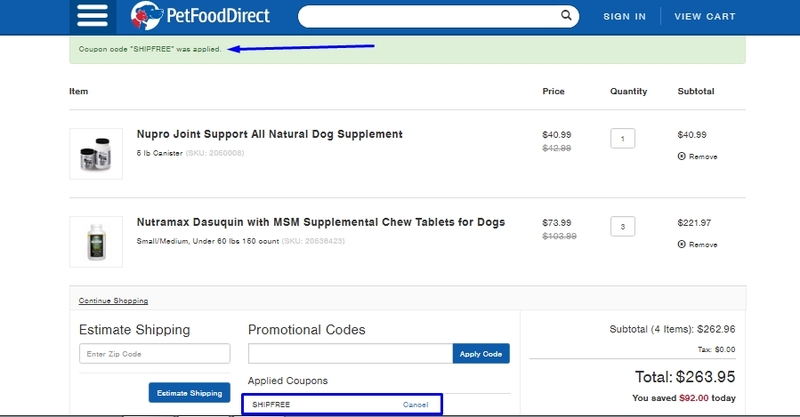 Simply add the items you want to buy to the cart or bag, then apply the promotional code and you will get this limited time offer that offers you PetFoodDirect. Liliana Gonzalez This is an amazing deal that works as described. Just apply this promo code SHIPFREE to your shopping cart to enjoy the discount. Marc Evans I am validating that this deal works as described. Offer ends at 11:59 pm ET, June 18, 2017. Free Shipping valid on orders of $49 or more. Enter promo code SHIPFREE at checkout to redeem. 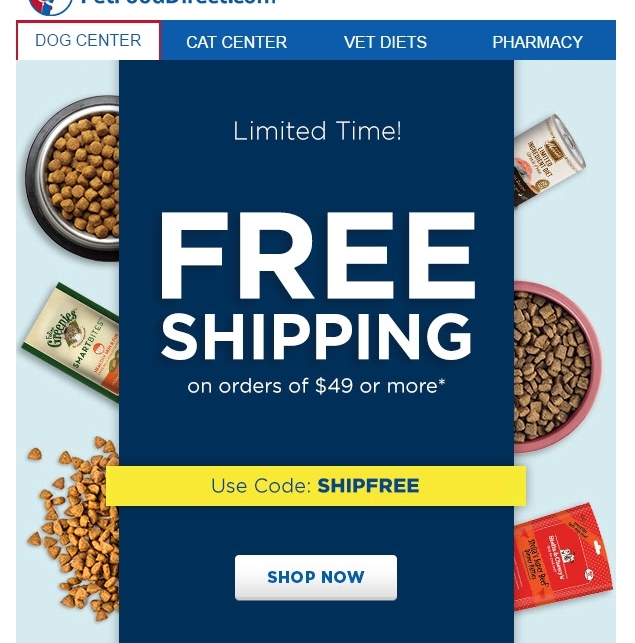 Hector Romero Free Shipping on Orders Over $49 at PetFoodDirect. Put code SHIPFREE in your shopping cart. Enjoy the discount. Augusto Teran I am reactivating this expired deal. 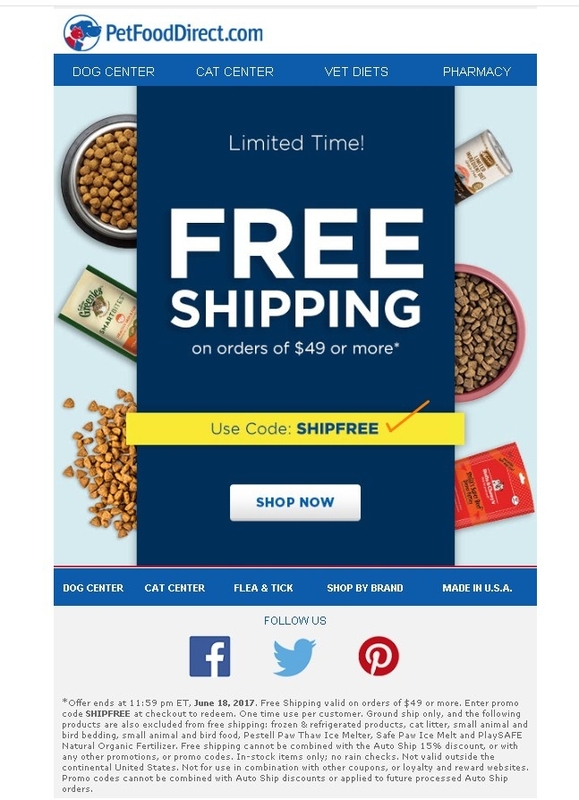 You can get Free Shipping on Orders Over $49 at PetFoodDirect. Use promo code SHIPFREE. Anthony Castro *Offer ends at 11:59 pm ET, May 23, 2017. 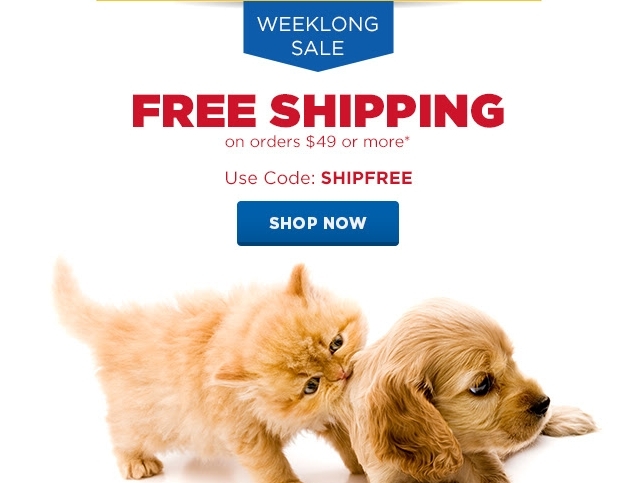 Shipping Discount Coupon is valid on orders of $49 or more. Enter promo code SHIPFREE at checkout to redeem. One time use per customer. Ground ship only, and the following products are also excluded from free shipping: frozen & refrigerated products, cat litter, small animal and bird bedding, small animal and bird food, Pestell Paw Thaw Ice Melter, Safe Paw Ice Melt and PlaySAFE Natural Organic Fertilizer. Free shipping cannot be combined with the Auto Ship 15% discount, or with any other promotions, or promo codes. In-stock items only; no rain checks. Not valid outside the continental United States. Not for use in combination with other coupons, or loyalty and reward websites. 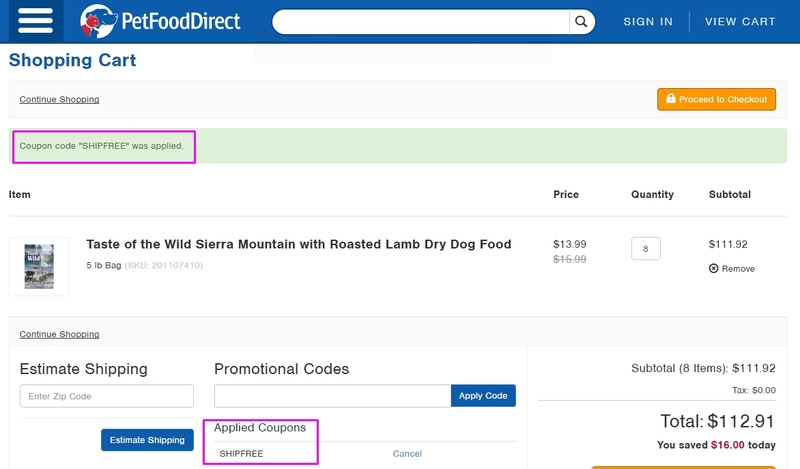 Promo codes cannot be combined with Auto Ship discounts or applied to future processed Auto Ship orders.